This 3 panel folding screen can be used as a room divider to enhance ambiance in the room and also adds a touch of flair. With its soft white stained, solid wood frame and fabric inlay windowpane pattern,This simple design will be an amazing accent for your home. This 3 panel folding screen can be used as a room divider to enhance ambiance in the room and also adds a touch of flair. This simple design will be an amazing accent for your home. This stunning wooden tray is exclusively brought to you by Hobbit Hole Co. It will perfectly complement your side tables and can also be used to serve your guests. The sturdy wooden construction looks and feels elegant. It is packaged with care and can be reused for all your occasions. Nomad is a modular architectural system that can be assembled into freestanding, temporary partitions without hardware, tools or damage to existing structures. Made from recycled, double-wall cardboard they are available in ten colours in packs of 24 sheets. Each box contains 14 square foot sections of wall. The modules can be arranged into open or closed configurations creating private environments or light and airy room dividers. The Nomad System can also be configured to create doorways and corners, easily adjusting to any indoor space, including lofts, basements or even office spaces. Perfect for studio apartments, lofts, and open floor plans, Nexxt Bota triple-panel floor screen divides a room while adding a unique artistic accent. The freestanding screen is constructed of creamy white stretched canvas with silk-screened print of trees and bird silhouettes in white, taupe and burnt red. The layered, silhouetted images are sleek and modern in style, and they provide interesting depth and dimension in any space. The screen comes fully assembled and measures 48 inches wide by 71 inches high by 1 inch deep when open. 3-Panel Folding Screen Room Divider with White Frame & Fabric Inlay This 3 panel folding screen can be used as a room divider to enhance ambiance in the room and also adds a touch of flair. With its soft white stained, solid wood frame and fabric inlay windowpane pattern,This simple design will be an amazing accent for your home. 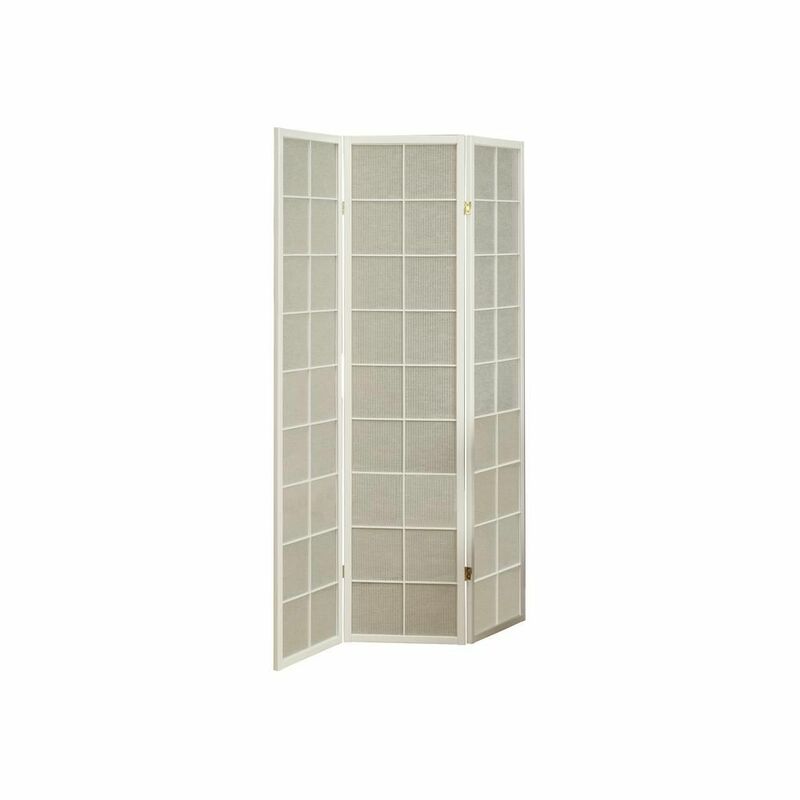 3-Panel Folding Screen Room Divider with White Frame & Fabric Inlay is rated 5.0 out of 5 by 1. Rated 5 out of 5 by Al from Very nice These room dividers were beautiful! We bought them to stand in front of a wall of past presidents at a country club. But unfortunately the white fabric inlays were too sheer, and we could still see through to the wall of past presidents. Unfortunately we had to return them. I wish I had a different place for me to keep them in my house somewhere, but we didn't. The return process was easy and the person waiting on us was very respectful. Do the hinges go both ways to make a u shape?